Football betting is extremely popular throughout the UK. Many of the world’s premier football teams and players readily compete in the English Premier League, with top clubs like Liverpool, Tottenham Hotspur, Arsenal, Chelsea, Watford, Manchester City, Bournemouth, Manchester United, Leicester City, and Everton. The fast-paced football action is coupled with worldwide interest in the performance of these teams. Football betting and Live – betting is based on chance, anything can happen at any time during a football match. Recall Leicester City’s unbelievable odds of winning the English Premier League in 2016? This underdog team came from behind and snatched victory from the jaws of defeat. With determination, good fortune, and ability, teams can perform better in football matches than expected. Pitch conditions, injuries, substitutions, home crowd advantage and other factors can turn a game on its head within seconds. The short and sweet answer is no. Just like no amount of statistical modeling can tell you what the result of a coin toss will be, nobody can provide ironclad assurances that a football match will go one way or another. Karamba’s approach is different: we provide football bettors with information concerning the team and the game itself. If Team X is playing against Team Y, it may be useful for a bettor to know that Team X has beaten Team Y 10 times out of 10 in the past. Or, that Team X scores twice as many goals against Team Y when playing at home. Keep in mind, however, that stats are useful but can NOT eliminate the risk factor. Football predictions are just that – peering into a crystal ball and providing an opinion as to which way the match will go. In order to come up with solid bet recommendations it is necessary to take into account information about past performances, football news updates, pitch conditions, substitutions, current rankings, home and away results etc. As said, there is no way to eliminate risk from football betting, and it is precisely this risk that results in favourable odds on longshot predictions. Gathering all this information is difficult, not to mention time consuming, and that’s why we have created the KaramBot! The KaramBot is an exclusive bet recommendation engine developed by the tech team at Karamba. 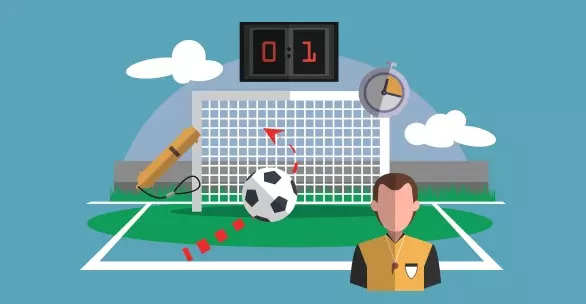 It is a technical tool which provides information for football bettors, helping them to place smarter bets both before kick off, and live during the action. Naturally, no amount of number-crunching or statistical analysis can guarantee favourable outcomes. The KaramBot is not a personal droid that will iron your clothes, wash your dishes, and run the bathwater for you! It’s a tool that analyses information and provides bet suggestions based on this information. The football betting market is a constant hive of activity. The KaramBot analyses a staggering amount of football statistics and utilises this information for recommendation purposes only! In February 2018 alone, this bot churned out 1,905 suggestions across 276 leagues. This in no way ensures the accuracy of outcomes, nor does it guarantee profits at any time. It is simply a powerful resource which has been extensively backtested using real football statistics based on actual football games. 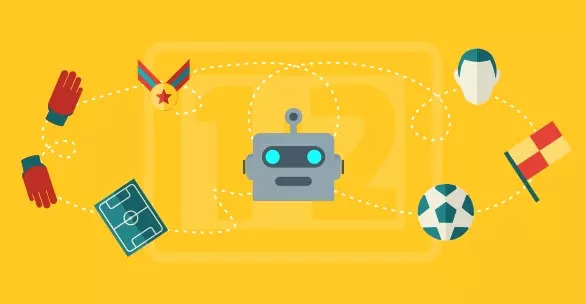 This football bot monitors data from ALL major football matches including the Champions League, the English Premier League, the Swedish Superettan, the International Under 17 Matches, and of course, the World Cup tournaments. Karamba Sports showcases all this information as pre-match football betting, or in a live betting format. #1 – It’s easy! Login to your Karamba Sports account to unlock the KaramBot. #2 – Pick LIVE, or STARTING SOON by clicking on the respective tab. #3 – For additional help, click on the ‘?’. Scenario settings can be applied, and the odds format can be changed by clicking the Settings button. #4 – The numbers displayed indicate how many active bet suggestions there are under each tab. #5 – Flashing icons are meant to convey that the KaramBot has a new bet suggestion available. This suggestion can be added to a bettor’s Bet Slip, and then acted upon. #6 – At this point, bettors can select their stake and place their bets. The KaramBot regularly scans for information on football players to find out how many yellow cards have been issued, how many red cards have been issued, how many shots on goal there have been, how many shots off goal, and overall shots supremacy. This information can prove useful in understanding the performance of football teams. Other valuable statistical information includes possession, log standings, fouls and other dangerous events etc. This information is collected and analysed rapidly by the KaramBot. The KaramBot does all the legwork for football bettors; even calculating new bet recommendations while the match is live. For football fans, this can offer many benefits. For starters, bettors are not required to investigate statistical data while matches are taking place. The KaramBot already does all of that. In the world of sports betting, there is no guarantee of success regardless of the tools and resources that are used. However, access to the right information is always appreciated by players. The KaramBot starts monitoring football teams 90 minutes before kickoff. If any team news emerges, the KaramBot will seek out dropping odds and relay this information accordingly. If, for example, any of the star players from a football team are dropped, this naturally results in less favourable chances for that team to succeed, and will be reflected in the overall odds that are offered. Thanks to 100% uptime, the KaramBot is able to continually scan the football betting markets, analyse relevant information, and process it in real time. The football data is scanned from all over the world, including (but not limited to) the following leagues: UEFA Champions League, Serie A, English Premier League, and La Liga. Various lesser-known football leagues are incorporated into the ‘stats pool’, including the Scandinavian leagues. Karamba Sports provides a large range of football betting odds on all the matches in the above leagues and more. Players have the option of pre-match betting or live in-play football betting. The KaramBot churns all the stats into actionable decisions. 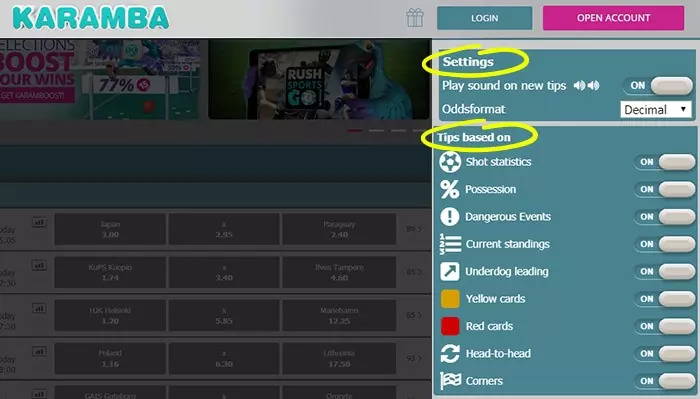 Players can choose to place bets on the suggestions, or simply read them for further information. There is no art or science to correctly predicting football outcomes. The best players can hope for is accurate analysis of football betting data to assist in the decision-making processes. The Karamba team of football fans and technical experts works hard to ensure the functionality of the KaramBot. Rigorous backtesting from actual football matches is part of the process. Since historical data is used, stat gurus place value in the outcomes generated by the unique bet recommendation engine. Football bettors have carte blanche to decide where they pull their information from, but this resource really has it all in one place. Players have several options at their disposal when collecting information on football betting. First and foremost is a reputable, licensed, and active online sportsbook. Naturally there are sports betting pros who provide their opinions on which way matches are likely to go. Players should always read both sides of the argument for fair and balanced reporting. Football fans routinely consult online betting sites for information on sports betting. These resources are typically provided by experts with experience in the game, or by bettors with strong opinions on football betting. These ‘insiders’ often share their valuable insights about football betting with fans. It is relatively easy to access this type of information, and it is typically provided free of charge to football bettors. It is important to ensure that authoritative sources of information are used when making football betting decisions. Trust and accuracy are paramount. The credentials of the writer should be fact checked, and reviews of these information sources should be conducted too. It’s not enough to be told what is likely to happen in a football match, it’s important to know why the writer, football experts, or recommendation engine suggests as much. Fortunately, the KaramBot serves as an all-in-one resource for accurate, timely, and credible information for football betting fans. It includes a wide range of statistics on all manner of football elements including shots on goal, corners, throw ins, fouls, yellow cards, red cards, etc. The data is a valuable source of information and it covers almost every element of a football game, particularly in major European football leagues.